This week the House of Commons voted and convincingly rejected the proposed draft withdrawal agreement by a margin of 230 votes. Jeremy Corbyn thereon tabled a vote of no confidence, which the Prime Minster Theresa May survived. The Prime Minster has now invited party leaders to conduct a number of advisory votes. This is to ascertain what possible approaches the government could take which would have enough support in the commons to get a modified bill to ascend to the upper house. Any suggestions or changes must be on points which the European Union are willing to negotiate. Yet, following the magnitude of the defeat of the draft agreement, there is little incentive or willingness for the European Union to acquiesce to anything but minor changes. The Irish border backstop remains the foremost polemical issue, the European Union having already stated that a frictionless border can only be achieved by the UK’s continued participation in both the single market and customs union. The Prime Minister’s hope is that small modifications to the defeated bill would gain enough support to pass in the House of Commons. If the House of Lords then ratifies it, an orderly departure would follow on the 29th March. If the Prime Minster cannot get her deal passed, there seems to be three possible paths: the default ‘no deal’, a general election, or a second referendum; the latter two could intertwine. A no deal exit would make the United Kingdom a third country to the European Union and a Canada model trade deal might follow post hoc. In the event of a General election the Conservative Party would include the current deal, or similar , within their manifesto. A Conservative victory would therefore likely allow the party to push said deal through successfully. In the event of a Labour victory, we could be presented with a second referendum, which could be a party position, or an extension of article 50 and renegotiation of the deal. The European Union are only likely to acquiesce to an extension on the grounds of a general election or a second referendum. Renegotiating is likely to take a stance similar to Norway Plus. This option would see the UK remaining in the single market and permanent membership of the customs union. This would solve the seemingly unsolvable issue of the Irish border. However, would not see an end to freedom of movement – its biggest drawback for many, which they view as a betrayal of Brexit. The Norway Plus model would allow the UK to regain control of areas such as finance, fishing, agriculture and justice from the European Union. A version of this appears to be the proffered variant of Jeremy Corbyn. Such game theory is rather facile; however, it does present several macro political and economic factors that could impact the price of investment grade wine. On one of the two extremes a ‘no deal’ would certainly weaken the Pound further against the Euro and Dollar. The Liv-Ex 100 fine wine index has historically shown to possess a -0.67 correlation to the GBP/EUR, this equates to an opposite movement between fine wine and traditional markets and FX. The date this would happen is the 29 March 2019 and we would expect the Liv-Ex 100 to adjust to 335 or greater from today’s level of 312, a movement of 7.35% within a six-month period. The caveat being that a successful Canada style trade deal would theoretically claw back some of GBP’s losses. In the event of either a general election, or second referendum being called it would almost certainly cause the Pound to strengthen against the Euro, to two varying degrees. Taking the negative correlation to quantify the movement in investment grade wine, we would likely see some positive growth returned. Many analysts project a general election to move GBP/EUR to 1.3. Using the same correlation this would lead the Liv-Ex 100 to move -10% to 280. A general election could be called within a matter of weeks, or after an extension. Any currency-based movements tend to display at least a month delay in the investment grade wine market. As such, we do not believe such swings would come into effect until a result was achieved, certainly not solidifying these percentage changes in the short-term. A great strengthening in the pound is also projected by many if a second referendum is called. Many analysts view the GBP/EUR at 1.45. Using the same metrics, this would lead to a negative -19%, with the Liv-Ex 100 reaching 252. Yet once again, only a ‘remain’ vote would see this change solidified, over a post six-month period. These possible volatile changes caused by the pound are projected in the graph below. In conclusion, collectors holding investment grade wine have a natural hedge against the pound in the event of a ‘no deal’, which we posit would lead to around 7% growth. 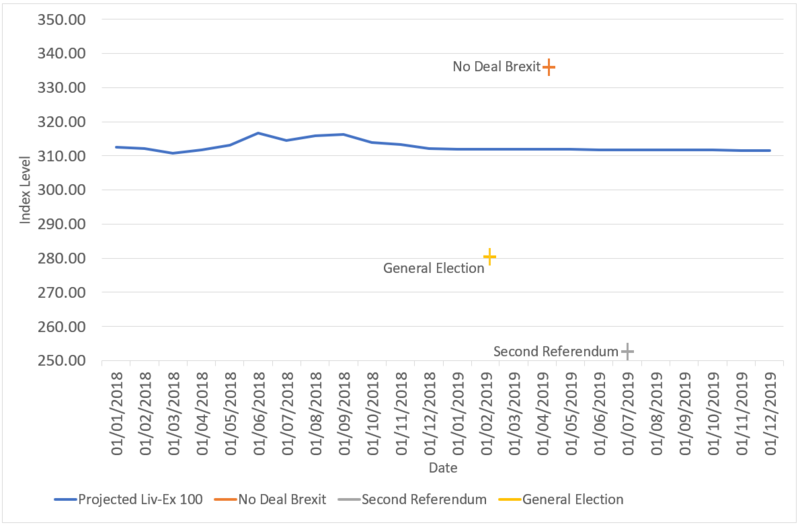 A second referendum leading to a ‘remain’ vote would almost certainly give back a minimum of 10%, to as high as 19% over a 12-month period, we believe closer to the former. Oscillations between these books-ends, are likely to be much smaller by comparison. We do not believe a general election would impact wine due to market inefficiencies and said election would come to pass quickly; only solidified macro events will trickle down. A modified version of the current deal is unlikely to impact wine in the short-term. A Norway plus deal, which would present after a general election, while strengthening GBP from today’s levels, would likely be counteracted by the positive sentiment in the wine market over the inclusion in the customs union. This would create negligible swings in investment grade wine based on GBP in the short-term. It would therefore follow, collectors can be confident of holding wine throughout this time of uncertainty. Likely, the only currency impact that could give back some of the recent gains in the most highly correlated investment grade wines, First Growth Bordeaux and other Grand Crus, would manifest after a referendum and a ‘remain’ vote. Much of this could be offset with positive economic expansion and a continuation of the UK remaining the most important Fine Wine storage hub, if it remained part of the EU. In times of economic doubt, investment grade wine remains a port in a storm!